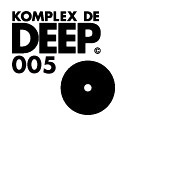 Komplex de Deep the new label of Master-H, and the purveyors of all that is elegant and classy in the realm of house, make are welcome return with what is set to be their next release. The artist is non other than the music genius, Matthias Vogt. Best known as one half of the Motorcitysoul duo, alongside Christian Rindermann aka C-Rock. The pair have been responsible for some of the finest productions and remixes from the deeper realm over the past few years. Their ability to create grand, atmospheric and emotional moments for the floor has seen them release and remix for fantastic labels including Cocoon, Freerange, Simple, Conaisseur, Liebe Detail, Junior Boys Own, Tsuba and their very own Stir 15. As a solo artist Matthias has carried those production skills, adding his own flair and direction. Urban Torque, INFRACom!, Gedankensport and Fresh Meat have all released his music to great response and support. Matthias' skills do not just sit in the electronic dancefloor realm. An accomplished pianist and jazz lover, his role as bandleader in the 'Matthias Vogt Trio' sees him bring acoustic jazz and electronica together in exciting, imaginative live compositions. Today's release 'Hofats' sees Matthias keeping it deep, whilst using melodic and powerful 'Detroit' touches. A dream of a production, its layers of smooth synths are expertly built upon, and whilst never peaking, Hofats traps us in its mesmerizing wake. On remix duty its H's good friend and label artist Francois Dubois. When he's not lounging in the Spanish or Parisian sunshine, FD is creating some of the most beautifully classic, deep house. Here again he brings his magic touch to Hofat and delivers a sunrise record of the ultimate order. Just sit or lay back, and... Enjoy! Scope - "Dope deepness from a true house music aficionado.. excellent!" Basti - (Lovebirds/Kneedeep) - "Original is nice too but for me its francios mix!! nice one!!" Hector Romero - "Can't get enough of well produced House Music - remix rocks as well!!!" Seth Troxler - "The Francois Dubois remix is killer!" Guy J - "Original really nice , thnx , good luck!" DJ Yellow - "Francois Dubois mix is really good.... deep and funky....totally into the label...full support!" Laurent Garnier - "EXCELLENT du bonheur en barre MERCIII pour les Great vibes." Gorge - "This is nice for warmup." Orde Meikle - (Slam) - "Top top label - great original and super remix - support from Slam!" Arnaud le Texier - "I like Francois dubois remix! Superb vibe!" Tiger Stripes - "FD Remix is really nice! Original is also cool." Hernan Cattaneo - "Amazing deepness. 4 stars!" Liapin - "Great Francois Dubois Remix! love the fantastic atmo in it!" Coyu - "Lovely remix from Mr. Sandberg, masterclass! We need more like this!" Alex Santos - "Like the François Dubois Remix." Nekes - "This is great ....."
Paul Woolford - "Loving the original which brings to mind Larry Heard at certain points.... Stir15 released one of my favourite house tracks of all time in 'Keep On Turning' and ever since then I've kept my ears and eyes out for more from that stable." Nic Fanciulli - "Francois Dubois mix is quality!" Matthew Dekay - "Amazing amazing amazing :)"
Osunlade - "Love this one..the remix is very nice also!" Tll von Sein - "Francois Dubois mix is good stuff." Gel Abril - "Francois Dubois mix is great tnx." Fabio Giannelli - "Nice music! I like the deepness in the Dubois rmx, very nice.."
Lee Burridge - "Loving the remix." Deetron - "Bravo Francois, un vrai tueur, chapeau!" Onionz - "Francios Dubois is a baaaad man!" Shur-I-Kan - "Good stuff, the Dubois mix is deep.. played on my radio show." Roual Galloway - (Faith Fanzine/Radio) - "The Francois Dubois dub doe it for me." Phonic Express - (RTE Ireland) - "Francois Dubois is the biz. Always delivers the goods. Theres not much else to say. Im all over it!" Dinamo FM Istanbul - "I love this label and of course every single release. Ace again!" Tsugi Magazine France - "Nice... and really deep!"